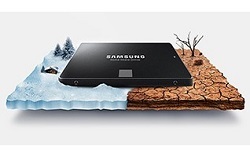 At the beginning of December last year, Samsung released their latest 850 series of SSDs that promises even better performance and reliability than their popular 840 series. Today, we’ll be looking at the 850 EVO 250 GB version, which is powered by Samsung’s 3D V-NAND technology. There are plenty of other unique technologies Samsung brings to the table with the release of the 850 series, so let’s go find out what this SSD is capable of! Below are the specifications as provided to us by Samsung. 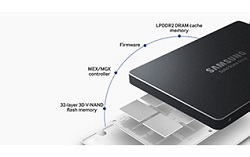 As you can see, Samsung uses a completely in-house design with its own MGX controller and 3D V-NAND flash memory. TRIM, Garbage Collection, and S.M.A.R.T. 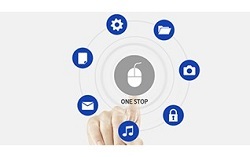 are all supported, as well as backward compatibility with all previous SATA interfaces. Impressive read/write and IOPS performance are noted in the specifications, so we’ll run our tests to make sure they measure up. Lastly, the 850 EVO series is backed with a 5-year warranty. 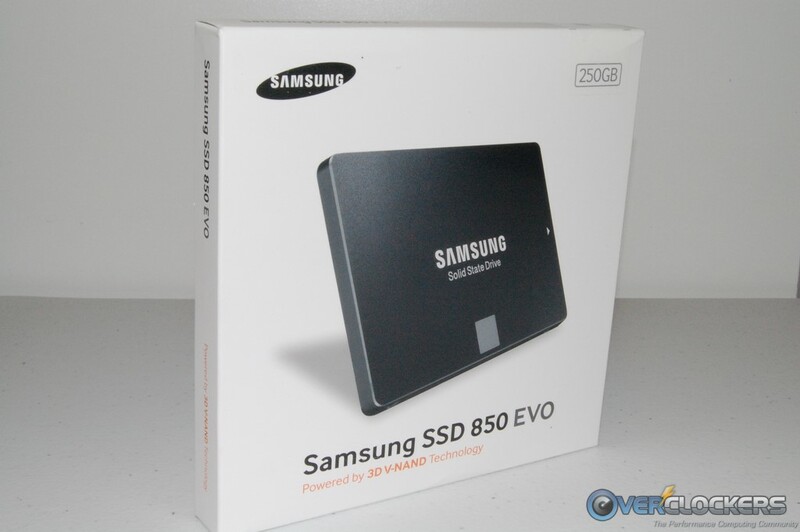 Below are the features associated with the 850 EVO series of SSDs. All images and descriptions courtesy Samsung. 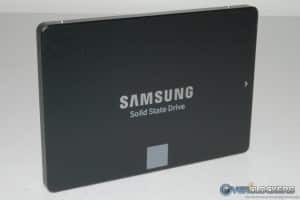 Driving the 850 EVO 250 GB SSD is Samsung’s 3D V‐NAND technology with TurboWrite for improved performance, as well as Samsung’s in-house 2-core MGX controller. This combination, according to Samsung, allows the 850 EVO to bring an improved user experience when compared to the 840 EVO. 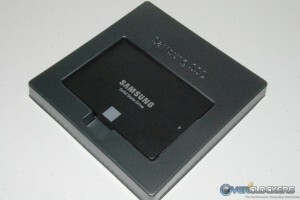 Samsung touts up to 1.9x faster random write speeds for the 250 GB model. Additionally, the 850 EVO offers a 5-year warranty and improved endurance numbers over the EVO 840. The 850 EVO is said to offer a 25% increase in power efficiency savings over the 840 EVO during write operations. Given that the 850 EVO uses the 3D V-NAND, the power usage claims can be believed as they use around half the power of traditional Planar 2D NAND. 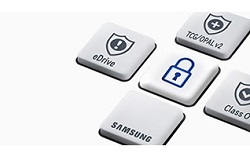 The 850 EVO supports data encryption through advanced AES 256 and a RAPID Mode that can be used through Samsung’s Magician software. The mostly white box provides general information about the product inside. The front has a picture of the EVO, the capacity printed on one corner, and branding at the bottom. 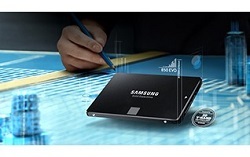 Around back, we have a few marketing phrases and a prominently displayed 3D V-NAND emblem. Once inside the box, the 850 EVO is sitting in plastic bed with the documentation and support DVD packaged underneath. The SSD itself is very sleek looking with just a minimal amount of branding on the top side. The bottom of the EVO has a label attached to it that provides the part number, model number, serial number, etc. 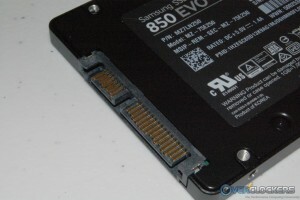 The Samsung EVO has the typical SATA and power connections. Mounting can be accomplished by using the four threaded holes at the bottom or the two threaded holes on each side of the drive. 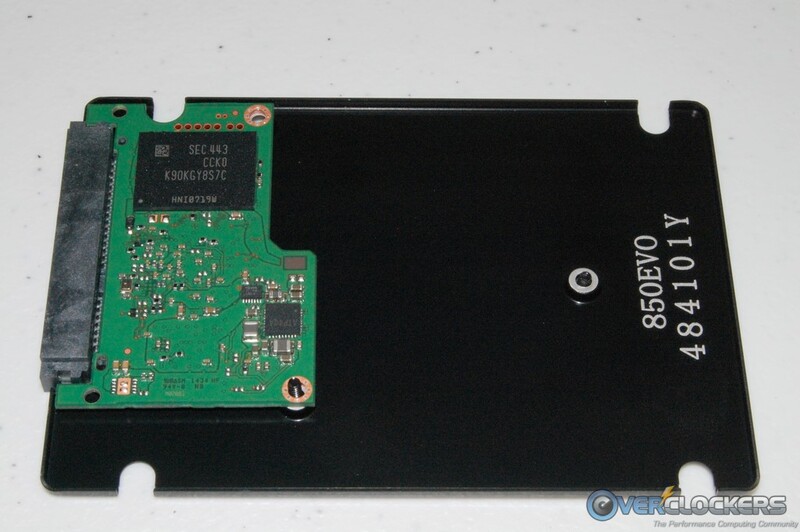 The next two pictures show you what’s inside the drive once it’s opened up. 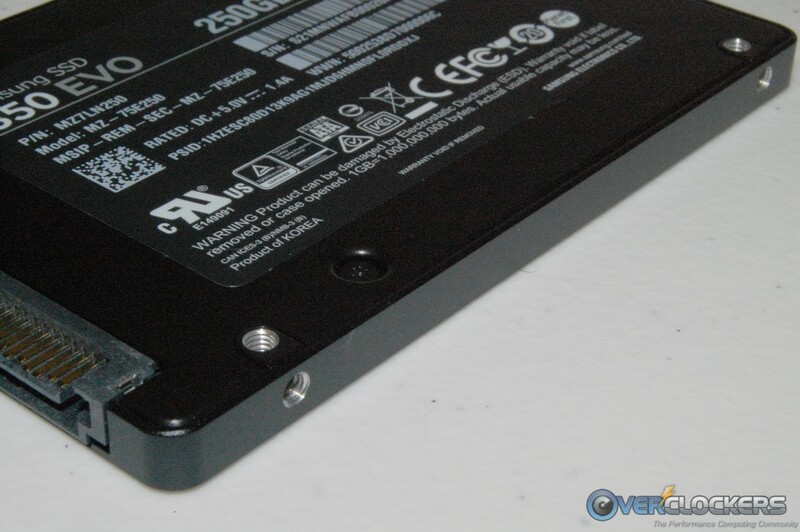 The EVO 250 GB SSD is so small that it only takes up about 1/3 of the space inside the casing. In the pictures below, you can see the 3D V-NAND, the 2-core MGX controller, and the 512 MB of DRAM cache memory. Here’s the list of components used in our test bed. 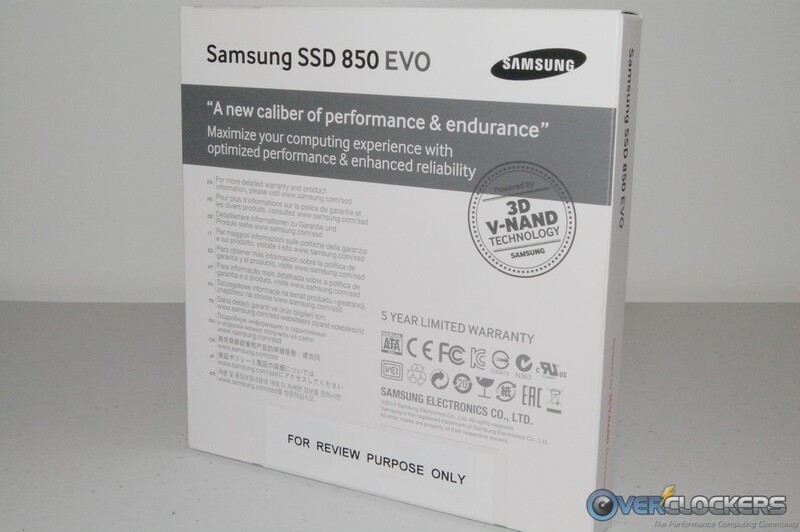 We have a variety of comparison samples, which include a Samsung 840 Pro and EVO. We’ll also toss in the recently reviewed Patriot Ignite and a couple of older drives from OCZ and Kingston. 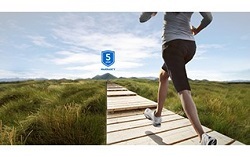 Each SSD was Secure Erased (SE) before each and every benchmark run using Samsung’s Magician software utility. This ensures we get the best results possible for each test run. Here are the benchmarks we run with a brief description. CrystalDiskMark (CDM) is designed to test read/write sequential, 512K random, and 4K random performance. 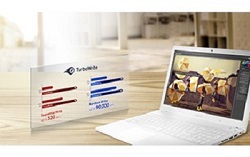 It’s very good way to test bandwidth under heavy load conditions. CDM uses incompressible data during its tests, so the sequential file transfer speeds will show lower performance numbers when compared to benchmarks that use compressible data, such as ATTO for instance. Starting with the CDM read tests, the sequential test shows the top four drives all within the margin of error and easily outpacing the OCZ Vertex 460 and Kingston 3KSSD. 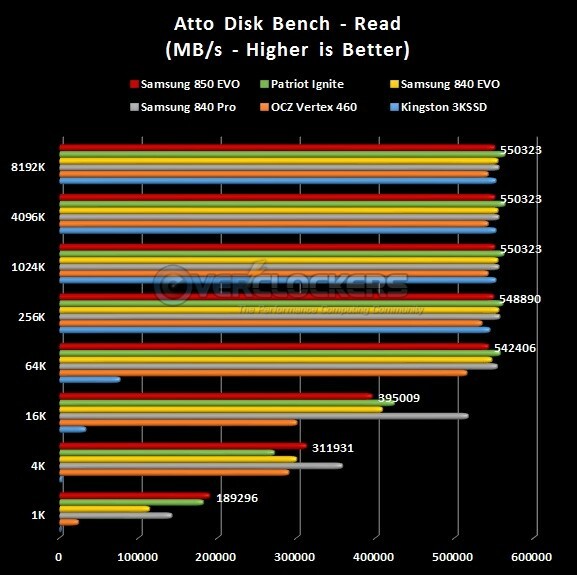 The 512K test had the 850 EVO in the middle of the pack and losing out to both the 840 series drives, but came out on top of the Patriot Ignite. The 4K test showed the 850 EVO putting the hammer down on all the competition and threw out an impressive 55.1 MB/s. 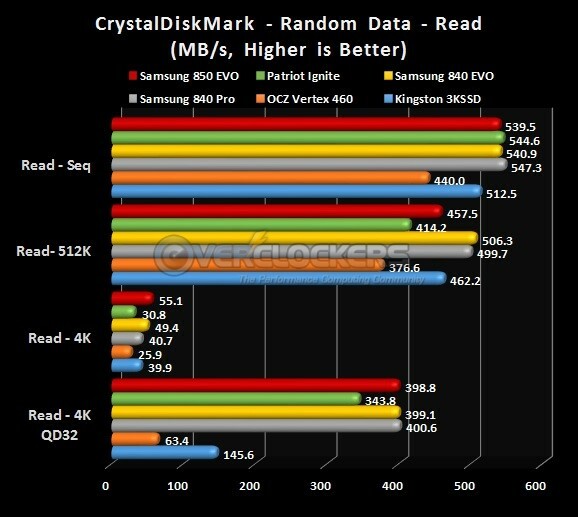 The 4K QD32 test had all three Samsung drives within the margin of error and beating out the Patriot Ignite. 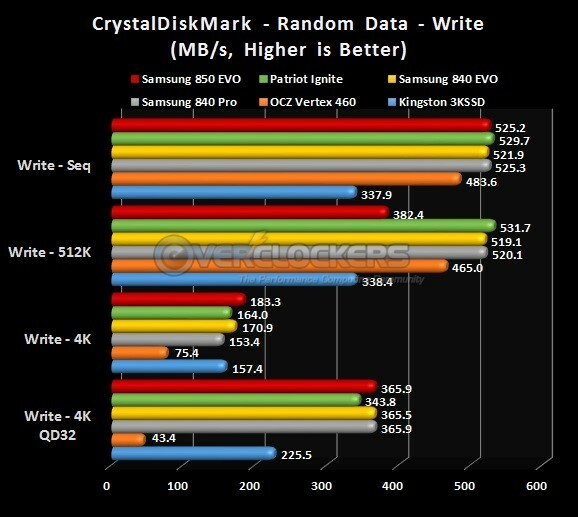 The older Vertex 460 and Kingston 3KSSD were no match in the 4K QD32 test. Moving over to the CDM write testing, we find a pretty similar pattern here. The sequential test again showed the top four contenders all within a whisker of each other, but the Patriot Ignite squeezed out a victory here. 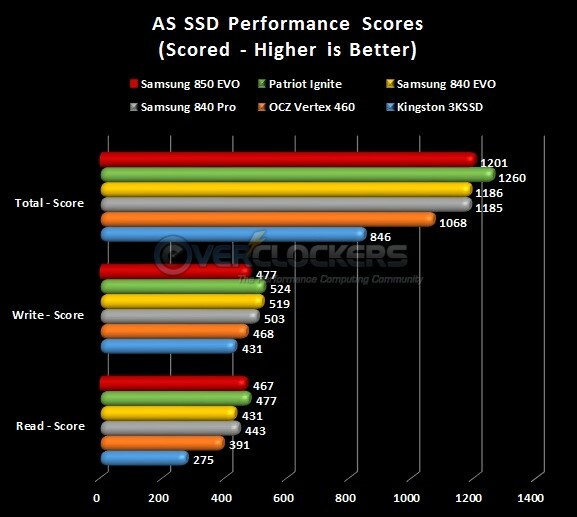 The 512K test was not kind to the 850 EVO, as it only managed to top the Kingston 3KSSD in this test. The 850 EVO quickly recovered in the 4K and 4K QD32 tests and took the top spot in both of those tests. Similar to CDM, AS SSD also uses incompressible data during its test runs. The read tests again show a tight group at the top of the sequential test, and the 850 EVO dominated the 4K test. 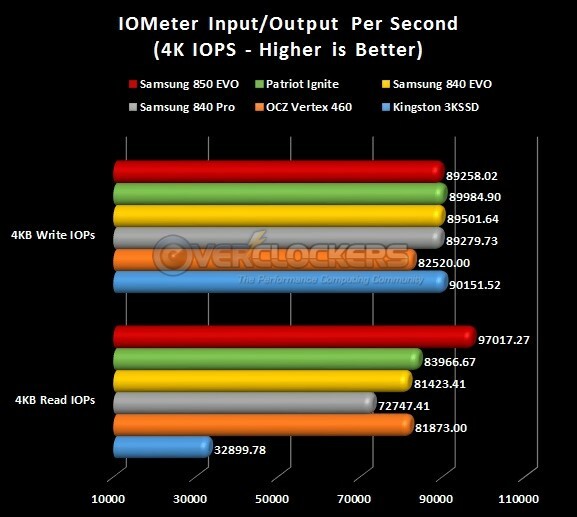 The 4K-64Thrd test had the 850 EVO falling short of the Patriot Ignite, but topping all the other comparison drives. 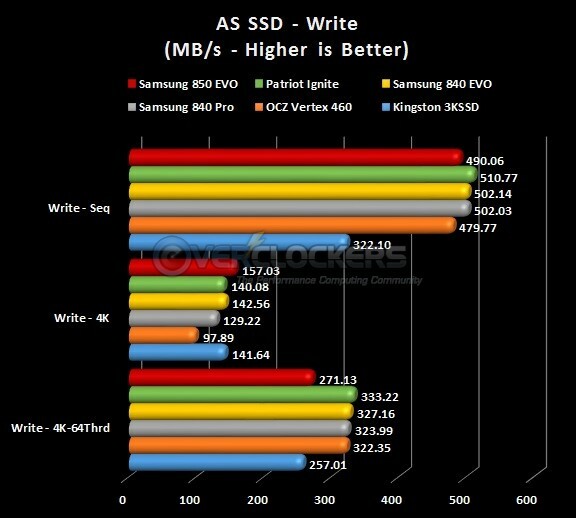 The AS SSD write tests were a mixed bag. 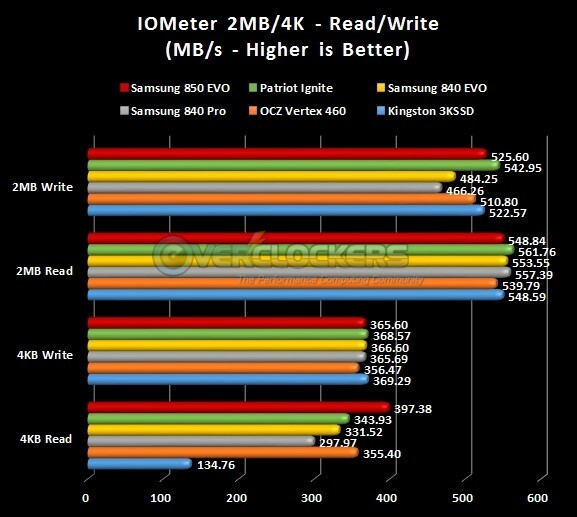 The sequential write test had the 850 EVO falling behind the Patriot Ignite and both 840 series drives. The 4K test again shows where the 850 EVO is at its best (comparatively speaking) as it dominated all the competition here. The 4K-64Thrd results were hard on the 850 EVO as it only managed to top the Kingston 3KSSD and was substantially behind the other competitors. 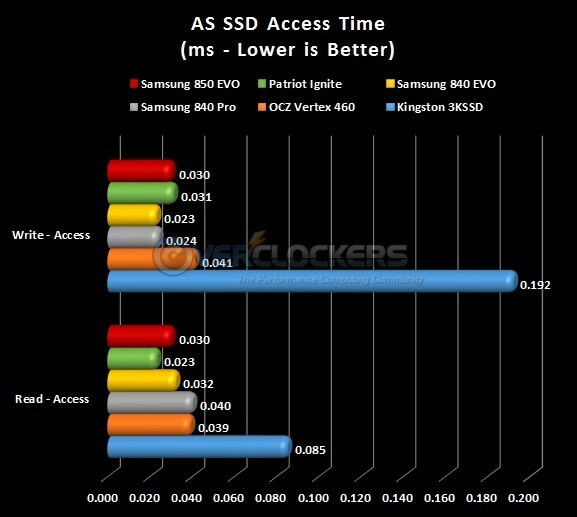 AS SSD reported access times that landed the 850 EVO in the middle of the pack during the write test. The read access time was more impressive, and the 850 EVO only lost out to the Patriot Ignite here. 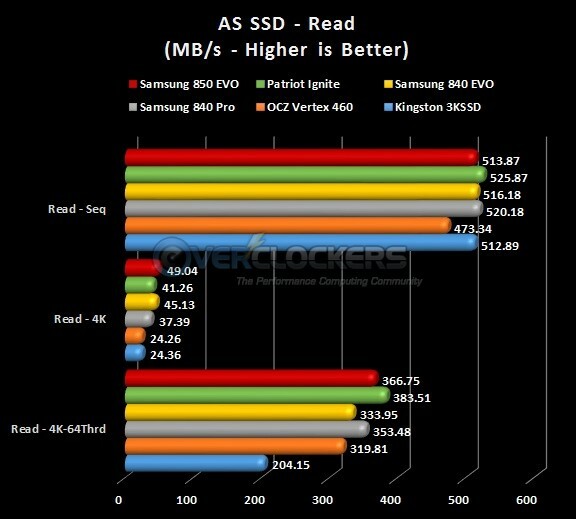 AS SSD also includes a scoring system based on overall read/write performance. The total score is the most important here, and the 850 EVO came in second behind the Patriot Ignite. Our IOMeter testing is set manually to test 2MB read/write, 4K read/write, and IOPS performance. The 4K tests are ran “Aligned” and with the QD set to 32. The 2MB write test shows the advantage going to the Patriot Ignite over the other comparison samples with the 850 EVO coming in a close second. the 2MB read test is another tightly knit group with not much difference between all the samples. 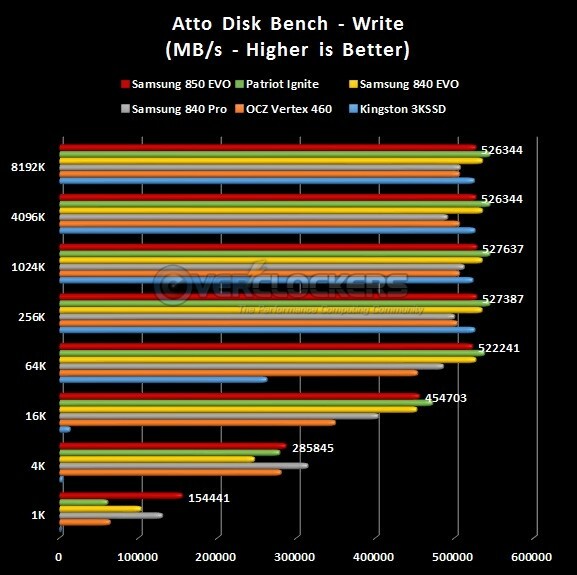 The 4K write test shows almost no difference between all of the SSDs we tested, but the 4K read test has the 850 EVO dominating all comers with an impressive 397.38 MB/s. 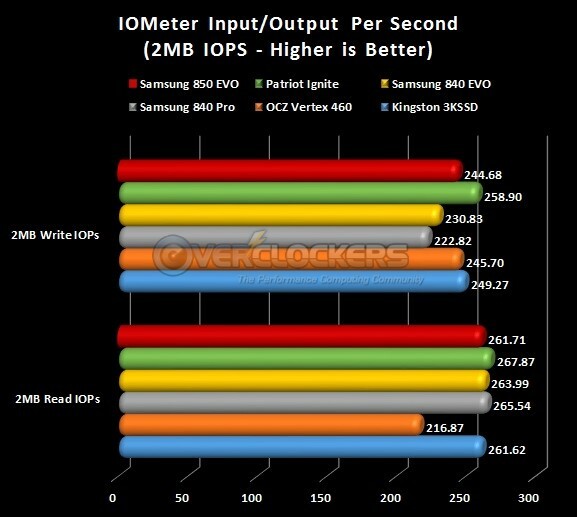 The 2MB IOPS write test had the 850 EVO beating out both 840 series drives, but falling victim to all the other comparison samples. The 2MB IOPS read test shows very little difference between five of the samples with the OCC Vertex 460 falling substantially behind. Moving over to the 4K IOPS testing, the top five write scores were all real close to each other with the OCZ Vertex 460 trailing behind. The 4K read results show an impressive win for the 850 EVO as it easily handled the competition. 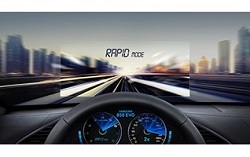 ATTO is used by most SSD manufacturers to claim their read/write speeds. The 850 EVO reached the speeds that Samsung touts, but in most cases was behind the 840 series drives and the Patriot Ignite. The graphs below only show the results for the 850 EVO, but the table below provides all the raw data used to make the graph. This is the point of the review where we normally provide a screenshot of Anvil’s Storage Utility, but we ran into a bit of a problem when we tried our final secure erase using Samsung’s Magician software. After using the Magician utility to SE the drive many times during the course of our testing, this time the procedure barked at us around the 50% completion mark and failed to complete the SE operation. From that point on, we were never able to get the 850 EVO to be recognized in Windows 7. We spent a substantial amount of time checking Windows Disk Management, SATA cables, power cables, etc. We were never able to resolve the issue. The drive showed in the list of hard drives in the motherboard’s UEFI BIOS, but that’s as far as any recognition of the drive went. No firmware downloads are available for the 850 EVO as of yet, so we asked Samsung to send us a bootable ISO image of the firmware that came on the drive, but they declined to do so. Instead, they sent a bootable version of their SE utility, which didn’t work either. The utility complained of the drive being “password locked”, which is a common error after a failed secure erase. 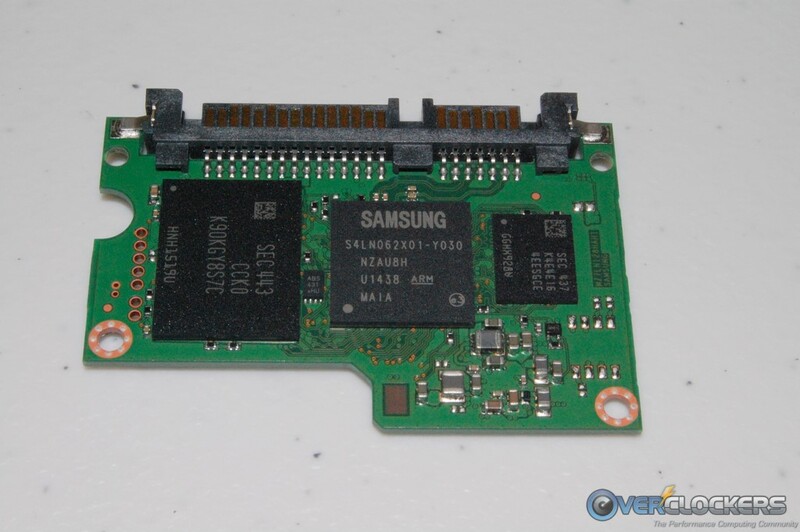 In the end, Samsung had no resolution to the issue and confirmed the drive had indeed failed. Samsung released Magician 4.5 alongside the 850 series drives to fix some compatibility issues with IRST (Intel Rapid Storage Technology) and bump the Rapid Mode feature to version 2.1. The Magician software has a lot of features that are well worth exploring, but I’d probably recommend the secure erase procedure be done via some other method… for obvious reasons. Having said all this, it’s quite possible our issue is an isolated one, and someone else may never encounter the problem. Our problems with the Magician software aside, the 850 EVO performed just as Samsung claims and even better in some cases. While the 850 EVO 250 GB drive is very fast, upgrading probably won’t appeal to enthusiast users who already own a newer, high-performance SSD. Sure, we have some new technologies Samsung implemented on the 850 EVO, but you’ll be hard pressed to notice them in real world usage when compared to the 840 series. However, if you’re looking to add a SSD to an existing system or building a new system, one of the most compelling reasons the 840 EVO 250 GB is worthy of consideration is the price. Newegg is currently selling the drive for $119, but I found it at Amazon for as little as $112. 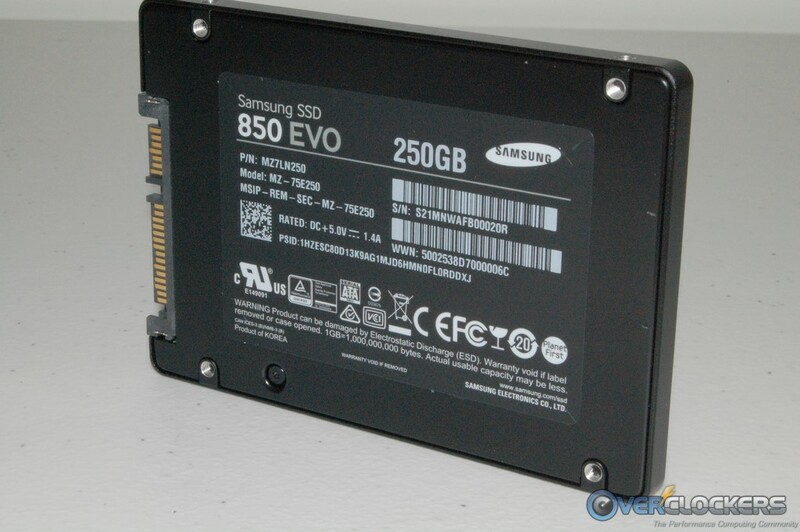 Those prices land the 850 EVO 250 GB at the lower end of the price spectrum for SSDs with similar performance numbers. Pricing is definitely not an issue. 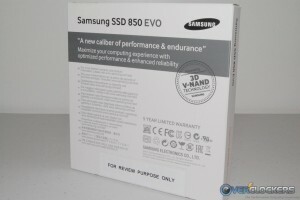 One of Samsung’s major selling points for the 850 EVO was improved endurance and reliability compared to the previous 840 series SSDs. 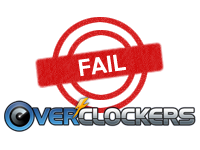 Unfortunately, we can’t vouch for that claim because the drive they sent us for review failed so quickly. We can only report on our experience with the product sent to us, so I can’t in good conscience give the 850 EVO our Approved award. 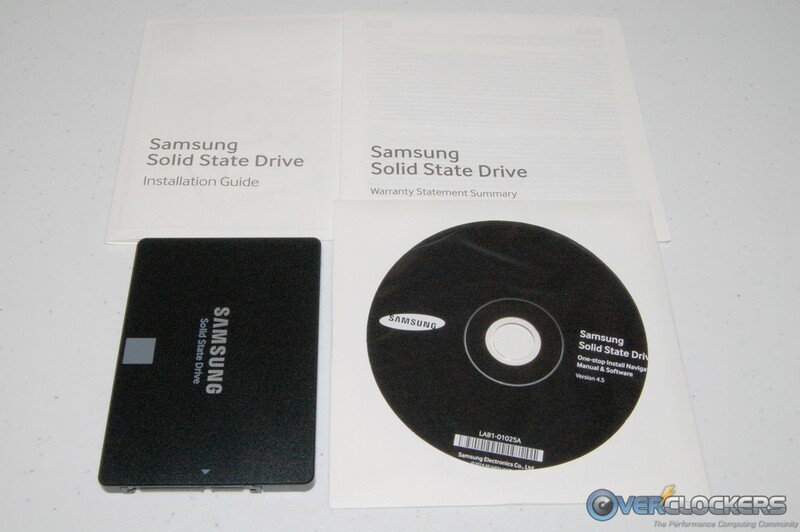 Furthermore, because Samsung confirmed the drive failed… well, you get the picture. NewEgg has it on sale For $99.00 for 3/10/2015 only ..
Oh since I have one coming do you want me to do some testing to better help the review out ?? Woulda bought one except I needed a mini. Saves me a full slot for a 6TB. I just put 2 of the 500g 850 EVOs in my rig below and am VERY impressed.